Three new series of definitive Mexico stamps were introduced between 1874 and 1883. 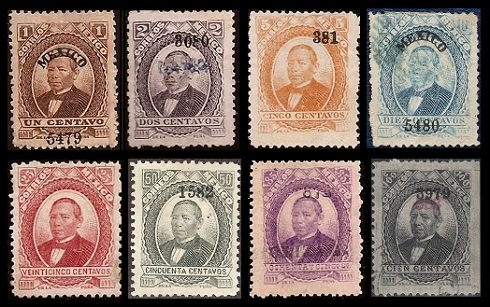 For the first time, the portrait of President Benito Juarez, who died in 1872, was featured on a set of definitive stamps, and at the end of 1883, the overprinting of district names, district numbers, and dates on Mexican definitive postage stamps would finally be discontinued. Between 1874 and 1883 only seventeen major denominations of definitive Mexico stamps were issued, but there were color and printing varieties of many of them, which can make collecting these stamps a bit of a challenge. The seven definitive Mexico stamps shown above were issued between 1874 and 1881. They are engraved and perforated 12 (sometimes irregularly). The image shown above features the major denominations of each of these stamps. The varieties will be described in their appropriate catalog detail tables. Though the frames of each of the stamps are different, they all feature the portrait of Miguel Hidalgo y Costilla. The Scott catalog attributes, for stamps that are unwatermarked and that are printed on thick wove paper (sometimes showing vertical ribbing), are as follows. 004 C. (1880 - Sc. #105) - Orange. 005 C. (1874 - Sc. #106) - Brown. 010 C. (1874 - Sc. #107) - Black. 010 C. (1878 - Sc. #108) - Orange, Yellow Bister. 025 C. (1874 - Sc. #109) - Blue. 050 C. (1874 - Sc. #110) - Green. 100 C. (1874 - Sc. #111) - Carmine. The Scott catalog attributes, for stamps that are unwatermarked and that are printed on horizontally laid paper, are as follows. 005 C. (1874 - Sc. #106a) - Brown. 010 C. (1874 - Sc. #107a) - Black. The Scott catalog attributes, for stamps that are watermarked "LACROIX FRERES" in two lines of block capitals and that are printed on thick wove paper (sometimes showing vertical ribbing), are as follows. 005 C. (1874 - Sc. #106f) - Brown. 010 C. (1874 - Sc. #107f) - Black. 025 C. (1874 - Sc. #109g) - Blue. The Scott catalog attributes, for stamps that are watermarked "PAPEL SELLADO" in the sheet and that are printed on thick wove paper (sometimes showing vertical ribbing), are as follows. 005 C. (1875 - Sc. #112) - Brown. 010 C. (1875 - Sc. #113) - Black. 025 C. (1875 - Sc. #114) - Blue. 050 C. (1875 - Sc. #115) - Green. 100 C. (1875 - Sc. #116) - Carmine. The Scott catalog attributes, for stamps that are unwatermarked and that are printed on thin wove paper, are as follows. 004 C. (1881 - Sc. #117) - Orange. 005 C. (1881 - Sc. #118) - Brown. 010 C. (1881 - Sc. #119) - Orange. 025 C. (1881 - Sc. #120) - Blue. 050 C. (1881 - Sc. #121) - Green. 100 C. (1881 - Sc. #122) - Carmine. 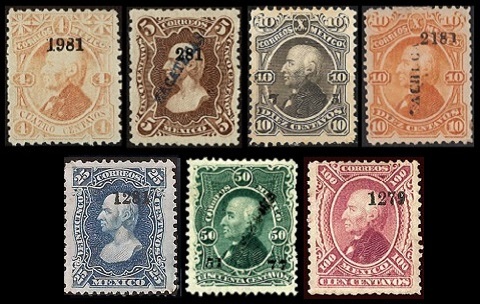 The eight definitive Mexico stamps shown above were issued between 1879 and 1882. They are engraved and perforated 12 (sometimes irregularly). The 1879 issues are shown above. The color variations of the 1882 issues will be described in their appropriate catalog detail table. The common design features the portrait of Benito Juarez. 001 C. (1879 - Sc. #123) - Brown, Gray. 002 C. (1879 - Sc. #124) - Dark Violet, Dark Gray. 005 C. (1879 - Sc. #125) - Orange. 010 C. (1879 - Sc. #126) - Blue, Ultramarine. 025 C. (1879 - Sc. #127) - Rose. 050 C. (1879 - Sc. #128) - Green. 085 C. (1879 - Sc. #129) - Violet. 100 C. (1879 - Sc. #130) - Black. 001 C. (1882 - Sc. #131) - Brown, Gray. 002 C. (1882 - Sc. #132) - Dark Violet, Slate. 005 C. (1882 - Sc. #133) - Orange. 010 C. (1882 - Sc. #134) - Blue. 010 C. (1882 - Sc. #135) - Brown. 012 C. (1882 - Sc. #136) - Brown. 018 C. (1882 - Sc. #137) - Orange Brown. 024 C. (1882 - Sc. #138) - Violet. 025 C. (1882 - Sc. #139) - Rose. 025 C. (1882 - Sc. #140) - Orange Brown. 050 C. (1882 - Sc. #141) - Green. 050 C. (1882 - Sc. #142) - Yellow. 085 C. (1882 - Sc. #143) - Red Violet. 100 C. (1882 - Sc. #144) - Black. 100 C. (1882 - Sc. #145) - Orange. The four numeral-type definitive Mexico stamps shown above were issued between 1882 and 1883. They are perforated 12 (often irregularly). Their Scott catalog attributes are as follows. 002 C. (1882 - Sc. #146) - Green. 003 C. (1882 - Sc. #147) - Carmine Lake. 006 C. (1883 - Sc. #148) - Blue. 006 C. (1882 - Sc. #149) - Ultramarine.